Sheary Offensive Zone Face Off | Ice Hockey Systems Inc. 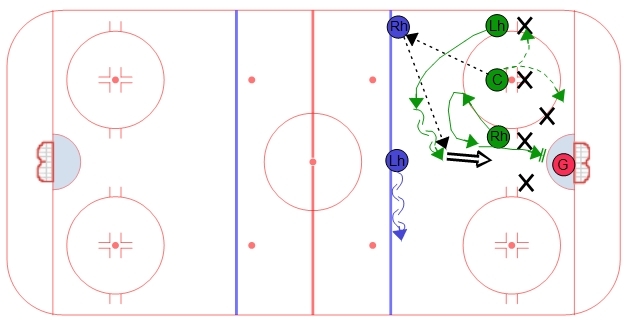 This face off play requires placement of players in certain positions to take advantage of their shooting hands. If executed properly it should create an odd man advantage high in the slot and give the defense several options to create a good scoring chance. The goal for the center is to win the puck back to the defense on the wall. The center then has two options, they can either become an outlet on the wall or go to the near post. The winger that is lined up on the inside will first go behind the center and make it tough for the opponents forward to get out to the defense. Then they will get to the net to create traffic. This will also create space in the high slot for the winger lined up on the wall. The outside winger will line up along the wall at the hash marks. Once the face off is won they will skate to the high slot and open up for a one-timer from the defense on the wall. The defense that lines up in the middle of the ice should also be available for a one-timer and work away from their defense partner with the puck. This way they can make it harder for the opponent to stay in the shooting lane and block the shot.